Though units won’t ship until March 19 (mid next-week), Paul Thurrott offers up a nice preview of the Surface Power Cover over at his SuperSite. Though this new device will add 1.2 lbs to the weight of the Surface 2. Surface Pro, or Surface Pro 2, it also promises to extend battery life by as much as 70% over an unattached Surface tablet of one of these kinds (this cover does not work with the original Surface RT). Though some claims from MS rate battery life increases as high as 70%, MS used a 50% figure at its product launch of the Surface 2 last year. The pre-order price for the Surface Power Cover is $199.99 at the MS Store. 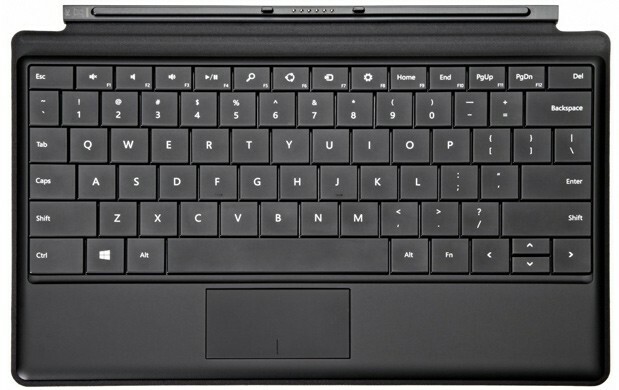 No backlit keys like the original Type cover, primarily to save on power consumption. At 9.75 mm the Surface Power Cover is 4.35 mm thicker than the Type Cover at 5.4mm. With the Power Cover at 1.2 pounds and the Surface Pro 2 at 1.5 pounds, the combined weight is 2.7 pounds, or 0.3 pounds heavier than a MacBook Air 11 model. But, as Thurrott points out, it’s still 0.3 pounds lighter than the average ultrabook PC. It still works well as a detached tablet, too. It’s also 1.4 pounds lighter and $1,500 cheaper than my recently-acquired i7 U4600 Fujitsu Stylistic Q704 tablet with its battery powered keyboard dock (which also includes two full-size USB 3.0 ports, plus HDMI, VGA, and GbE connections as well). If the Power Cover can up the Surface Pro 2’s battery life to 8 hours or better, it gets my approbation. Because it currently sits at about 5 hours, and a 50% boost would up that to 9 hours, this may very well be the case! Stay tuned for further follow-up and testing.